Stomachaches can strike any of us every now and then. But for some individuals, stomach discomforts or acid reflux hit them more often than usual. For seniors who receive care at home, our Home Health care in Northern Virginia can help them manage their GERD or acid reflux at home with techniques that involve good meal planning. 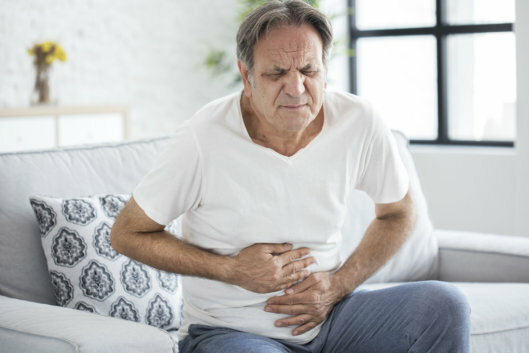 GERD stands for gastroesophageal reflux disease where the lower esophageal sphincter (LES) a ring of muscle responsible for the opening and closing of the connection between the stomach and the esophagus, does not consistently close to prevent food from the stomach from going back up to the esophagus. This results in a sensation you feel when you can taste stomach acids reaching your throat and leaving a sharp acid taste in your mouth. Seniors with chronic diseases like GERD can now safely manage their condition at home with the supervision of our certified nursing aides or our registered nurses. Instead of lying flat or on a low pillow, try elevating your sleeping position so that your head will be higher than the level of your stomach. You can do this by inserting yoga or wooden blocks under your mattress or directly use a size-appropriate mattress wedge since it equally offers the same effect to significantly elevate the sleeping position. Individuals report acid reflux symptoms when they lie down after a meal. Avoid doing so to keep the food down and to allow your stomach to process the food. By maintaining a healthy weight, individuals can avoid adding unnecessary pounds that will only intensify the pressure on their abdomens, affecting the stomach and then causing the acid reflux symptoms. If drinking too much soda triggers acid reflux in your body, minimize the intake of soda or consume your drinks gradually so as not to put immediate pressure on your stomach. Slowly pace how you consume your food. This way, you get to enjoy the different flavors and savor the moment when you get to sit down and take a break. Eating too fast will not give you enough chances to chew your food; therefore, you are swallowing big chunks of food down to your stomach, ultimately causing trouble like indigestion. With the supervision of our Home health care in Prince William County, your beloved seniors will be properly guided on how to manage, avoid and remedy any symptoms of stomach discomforts. To know how you can maximize your care plans at Humble Home Health LLC, please call 703-304-3777 for more information on our different healthcare services and insurance plans accepted. This entry was posted in Stomach Discomforts and tagged acid reflux, health care, Home Health, stomachaches. Bookmark the permalink.